At UFC 207, all eyes will be on Ronda Rousey once again, but this time it’s with an inquisitive stare rather than the leering gaze of appreciation. The former bantamweight queenpin returns to the Octagon for the first time in more than a year following the bludgeoning head-kick KO from Holly Holm. But she returns with a different look. Ever since suffering the devastating first loss of her career at UFC 193 in Melbourne, ‘Rowdy’ has been anything but her alias would suggest. The defeat, and the one-sided nature of it, seemed to shackle her mentally in the ensuing months, with the sport’s biggest star reclining into a reclusive state away from the spotlight, which saw her set pay-per-view records and main event shows around the world. Indeed, there’s an air of vulnerability to Rousey as she prepares to take on current champion Amanda Nunes, one unerring given her ability to eviscerate foes in a way never seen before. She has candidly and bravely talked about the suicidal thoughts she had in the immediate aftermath in one rare interview while the UFC granted her desire not to do any pre-fight media obligations leading up to Saturday’s title clash. It all means there are a myriad of questions to be answered. Will she be a different fighter after such a long lay-off? Is she strong enough mentally to be victorious? Can she handle the power of Nunes? And, what happens if she loses? 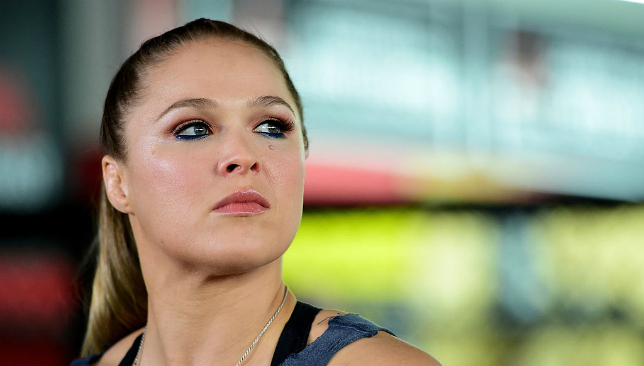 Rousey, despite coming off a defeat, is still undoubtedly one of the UFC’s biggest draws. But her future remains uncertain with many arguing a second-straight loss will see her walk away from the sport she pioneered. If that is to be the case, and Saturday’s main event in Las Vegas is one of the penultimate stops, then what does this mean for the UFC? New owners WME-IMG desperately seek star power to illuminate a brand which set them back $4.2billion. It makes fighters like Rousey, a unique blend of ferociousness inside the cage with a Hollywood smile outside of it, a rare commodity. She has options away from prizefighting with her dominance and the life story for which it was built upon catching the attention of movie makers. Given her reluctance to promote this comeback fight and her unwillingness to indulge other annoying nuances which come with being a megastar, win or lose Rousey may be prepared to walk away. To a degree, though, her job is already done. UFC president Dana White confirmed this month a new 145lb division will be opened up with Holm set take on Germaine de Randamie for that crown. The opening of a third women’s weight category is another major milestone, especially when you consider that before Rousey’s debut against Liz Carmouche in 2013, White declared no woman would fight for the company. Regardless of the outcome, Rousey will always be viewed as the standard bearer for women’s MMA. She has our attention once more, the question now, is for how long. There has been much hype around Ronda Rousey’s return to the octagon this Friday to face champion Amanda Nunes at UFC 207. Ahead of the fight, we take a look at each fighters top four finishes ever! Amanda Nunes is ready to make another statement next week. The 28-year-old defends her title for the first time against Ronda Rousey at UFC 207. Nunes is also the current UFC women’s bantamweight champion, who decimated former champion Miesha Tate to capture the UFC 135lb title in the main event of UFC 200. Interestingly, she did it faster than Rousey managed against Tate on both occasions they met previously. The Brazilian has a dangerous mix of powerful striking and top-drawer submission skills in her arsenal, and used both to devastating effect against Tate, destroying her with a powerful set of strikes as she beat her opponent down to the mat. Share with us your thoughts about the bout by commenting below, or get in touch on Twitter or via Facebook.